HBSA members have volunteered with The Barrio Center for 15 years, with an active after-school tutoring program. Student organizations at the University of Houston C. T. Bauer College of Business focus on personal growth and career development for members, but a priority for many groups is community service. The college’s Hispanic Business Student Association (HBSA) has a longstanding history of giving back to the Houston community through volunteer and service activities. Two of their philanthropic projects benefit The Barrio Center, an afterschool program for local underprivileged youth, and Houston area high schools, with an annual Youth Outreach Day to promote higher education. The organization’s relationship with The Barrio Center began 15 years ago, with HBSA members volunteering their time as tutors for young students and helping to renovate and upgrade the facility. Along with spending time with the kids, HBSA assists the program with school supply drives and holiday parties. But perhaps more important is the example the Bauer students set for the children who come to The Barrio Center, said Juan Castaneda, community relations director for HBSA. HBSA member Guadalupe Ordonez agrees, noting that she sees the impact she’s making every time she enters the building. The relationship between the HBSA members and children at The Barrio Center is powerful, said Rey Rodriguez, director of the facility. During Youth Outreach Day, members of HBSA led guided tours, showing local high school students what life on campus looks like. HBSA builds on that mentorship role with another community service project, Youth Outreach Day. Held this year on Nov. 4, the event brings to campus more than 350 students from local high schools, including Hall, Pasadena, Chavez and South Houston. The goal of the event is to emphasize the value of a college degree and to prepare prospective students in the process of selecting a school. HBSA hosts the students all day, with presentations from speakers and a tour of the university campus. Each HBSA member is also paired with a high school student in a mentor-mentee program. The student group benefits just as much as the children and teenagers they mentor, Ordonez said. “I believe if they ever think at times that no one cares about them or how they do in school when they’re older, they will look back and remember HBSA as the people who helped them understand why it is important to keep trying to succeed,” she said. 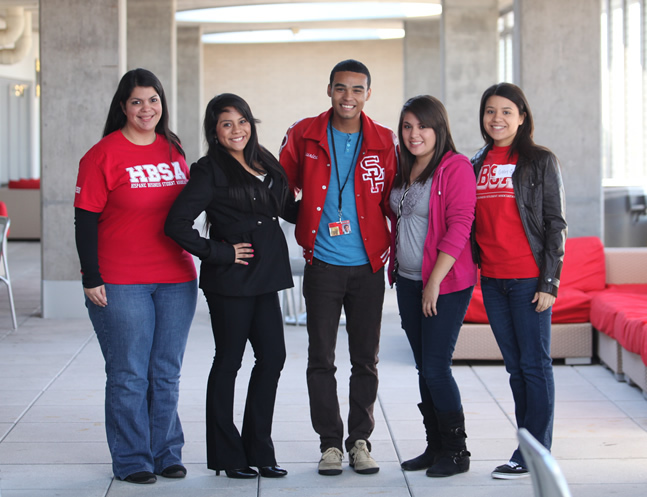 For more information on how to volunteer with HBSA, contact Juan Castaneda at community.relations@hbsa-bauer.com.